This Easter I had to opportunity to do a photoshoot with Angela Dekens from Little Owls. I have had my Hithfaereth gown for a year now and never had the time to take proper pictures with me in it. So when there was an opening to shoot with Angela, I decided to go for it. We went to a forest close by called Beetsterzwaag. Angela and her partner showed up with 4 owls in tow to shoot with. I got to put on a leather glove and a little owl was set on my arm. Something I did not expect was that the owls love to cuddle and are actually quite vocal. They also see everything, from other birds to little mice on the ground. It makes for quite tricky posing. They always look at what they find interesting, and that might not always be the lens. First up was little Norna. She was so cute! A lovely little Northern White-faced owl that just loved to talk. She has a little moustache that moves when she talks. She is quite excited about everything. 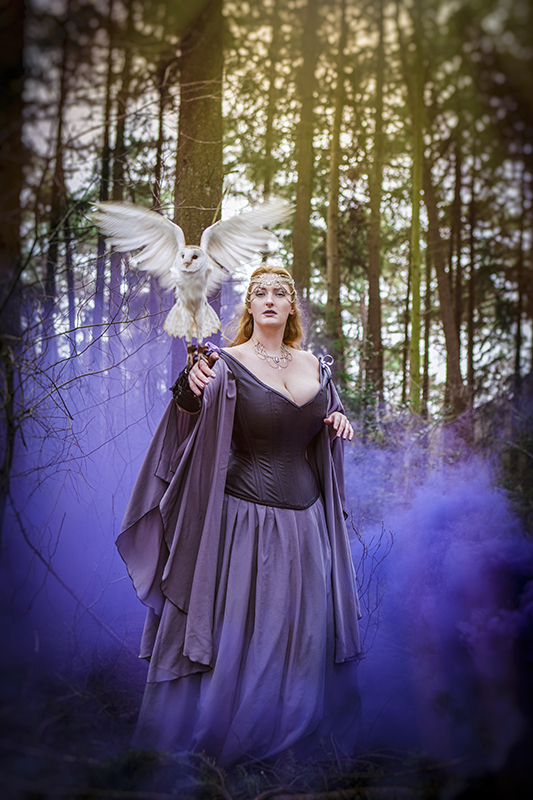 We also played around a little with a smokebomb in purple, that matched the gown perfectly. Next was quite a grumpy sir. Mr Bjorn. Bjorn is an African Oehoe. And although he is quite sweet, he can look quite stern. I love this shot since we both are looking out of the lake, making it a dreamy visage. Last was Dailah, a Bengal Oehoe. Now to be completely honest, although I have met Dailah before at Imaginairium, he does intimidate me quite a bit. It is probably the eyes, and the large claws. However he is beautiful. So a picture with him was a must. Shooting with the little owls was quite an experience. Angela was great in keeping me at ease and the owls are well trained. I hope you like these pictures. I know I do!